Replaced by Televac MP7FR Double Inverted Magnetron Cold Cathode Active Gauge PN 2-7970-X-YY. 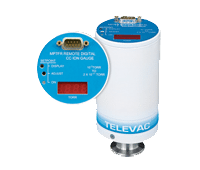 The Televac MP3DR is a miniature Bayard-Alpert high-vacuum sensor and integral control electronics in a compact envelope. It is designed to be closely coupled to the user’s vacuum system and to provide a local pressure indication and/or digital interface to a computer control system. The MP3DR derives its performance strength from Televac’s cutting-edge miniature Bayard-Alpert ionization sensor and user-friendly operation from its intuitive control and display interface.